C. A. DUVAL, ESQ., Manchester. JAMES FREEMAN, Esq., President of the Birmingham Chess Club. MORTON SPAEKE, Esq., Hon. Sec. to the Liverpool Chess Club. ROBERT CADMAN, Esq., Vice-President of the Leeds Chess Club. W. SCOTT, Esq., M.D., President of the Huddersfield Chess Club. C. A. DUVAL, Esq., President of the Manchester Chess Club. J. S. KIPPING, Jun., Esq., Manchester. Messrs. H. HASCHE, E. PINDAR, D. G. RALLI, M. B. WOOD. Manchester, on the 5th, 6th, 7th, and 8th days of August, 1857.
parts of England, as well as Ireland and Scotland. 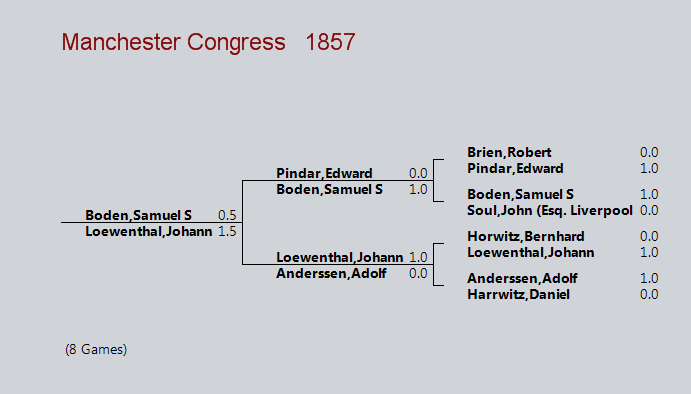 attendance of Herr Anderssen, from Breslau, the winner at the great? business of the game which all were assembled to play commenced. Boden………………………. ” Soul, of Liverpool. remain long enough to play again, conceded the prize to Mr. Lowenthal.